Hour of Code is now underway. This global movement exposes students to the power of computer science and is held during Computer Science Education Week, which runs this year from December 4-10. Code.org, the organization sponsoring Hour of Code, reaches tens of millions of students through over 100,000 events in more than 180 countries. An educational event of this magnitude requires a robust and secure infrastructure. AWS enables Code.org to scale up its website to meet demand and provide a positive user experience. “AWS was an obvious choice for Code.org to utilize,” said Jeremy Stone, Code.org’s Chief Technology Officer. “Redundancy and scalability were key factors in that decision.” Some of the critical services used during the event are Amazon CloudFront, Amazon EC2, and Elastic Load Balancing. Amazon CloudFront, a global content delivery distribution service, helps students obtain content from local servers during Hour of Code. This makes for a smoother experience for global participants, according to Stone. Amazon EC2 provides scalable computing capacity for Code.org’s front-end web servers. This eliminates upfront hardware investments and its reliability offers peace of mind, Stone says. Elastic Load Balancing and its auto-scaling feature has been a “game-changing solution,” according to Stone. The result is global engagement with massive scaling, which means funds saved, and elastic demand to support spikes in activity. How did you get involved with Code.org? I’m currently enrolled in a four-year engineering program that participates in Hour of Code activities every year. We spend the entire week doing projects for various Code.org activities. How are you personally participating in the Hour of Code this year? I will be talking to students at an Hour of Code event in Seattle about the importance of coding, and how it’s not scary. Lots of people think you have to be really smart to code, or be at a high level of math or science. Coding is very dear to my heart, and anyone can do it – even my grandma. 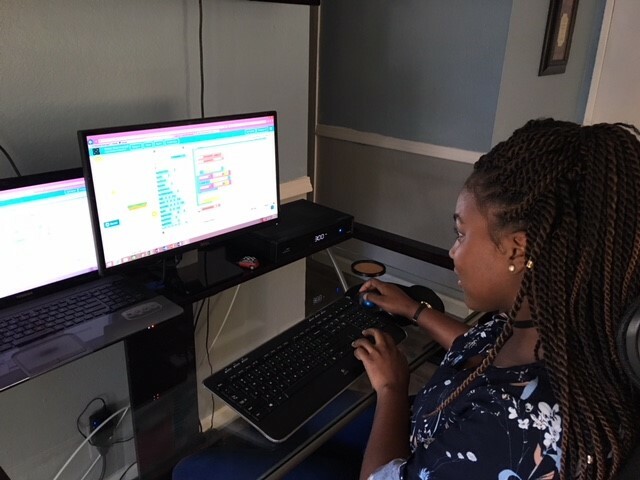 She now leads coding activities at my S.T.R.E.A.M. Expo events! What inspired your love for coding? In middle school, I was in a robotics class and had the opportunity to code a robot, turn on its lasers, and more. When I told my parents I was interested in coding, they sought out a high school engineering program. We started with just 10 girls in my class… now there are only three of us, and I’m the only African American. I’d love to encourage more people who look like me to go into STEM fields and coding. How have you integrated your love for coding into the S.T.R.E.A.M. Kids Expo you founded in 2015? When I was 13 I founded S.T.R.E.A.M (Science, Technology, Reading, Engineering, Arts, and Manufacturing), which is a platform for organizations to showcase their technology and for students to ask questions. And everything ties back to code. I love to show kids in lower-income, underprivileged neighborhoods all the possibilities available to them. We’ve now served over 4,000 students to date. So what’s next for those kids? How can we help nurture the work you do, and how will you continue to nurture it? It’s about providing more students with resources to code and by showing students how companies like Amazon use coding to build their products. And it’s also about showing parents how to support their children, or how students can seek support from their communities. What can your example demonstrate for girls and minorities as it relates to coding? Just by showing up and saying ‘I’m here and I’m doing it, and here’s how you can do it too,’ I can bring others along with me. In my engineering program, I’ve mostly had male instructors. If we want more girls, we need to bring in more women instructors and speakers so we have someone to look up to. Who is your superhero (real or fictitious), and why? I would say my mom will always be my superhero. She’s taught me so many things, but she’s always let me be me. She’s been very supportive and will always be my rock. Check out more of Niamani’s story here. AWS supports Hour of Code with a robust infrastructure, and also hosts Hour of Code events throughout the country. This involves over 300 Amazon employee volunteers, reaching more than 6,000 students. Check out our blog post to learn about our gamified learning tool that uses Amazon DynamoDB, built to support students participating in Hour of Code events. Find out how else AWS is helping students get an early start with cloud computing by visiting our AWS Educate page, and sign up at no cost.